Quite often, I forget how much I love spinning. I don’t own a wheel, only two drop spindles, so when I do spin it takes me awhile to get a finished yarn. I think that’s what puts me off. It’s a long term project. But last weekend, I got the urge to spin again. Nina picked out three tops from my stash and I picked from those (I wasn’t able to choose by myself). It’s one of my more recent purchases: UK Merino Top in Tobacco Rose from Wildcraft Fibres. Love it. Absolutely madly in love with it. 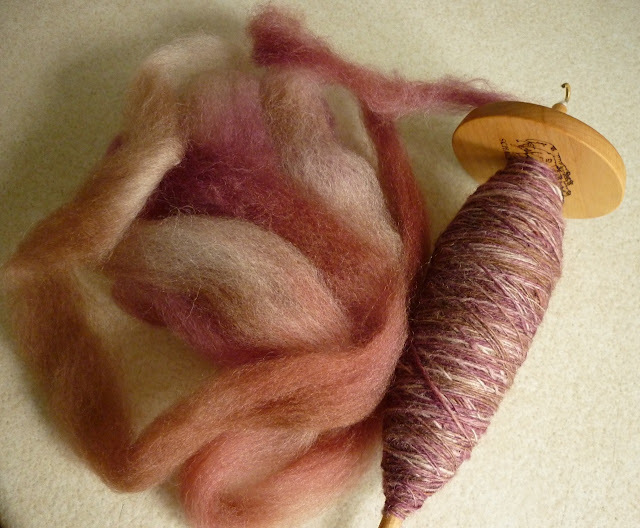 The photo of the spinning in progress does not do justice to the pretty colours. I’m almost halfway through the 100g. Might even have a finished yarn by the end of November (told you it takes me a long time to spin!). In knitting news, the Maluka scarf is done. Just needs to be blocked. It was a fun quick knit. No photos yet though. Keep watching my Rav feed though, photos might appear there sooner than they appear here. After I bound that off, I haven’t actually knit anything. I’ve crocheted squares for FrankenBlanket, but it’s just not as satisfying as knitting. And the reason why I haven’t been knitting? I’ve been working out the math for a new design. I don’t want to cast on until I’ve got it all worked out. That’s it for now. I know, not that exciting, but I can’t really talk about what I’m knitting until I’ve actually knit something. I kinda want to cast on a sweater and a pair of socks and a shawl and mittens and… well, I want to cast on a lot of stuff and it’s gotten to the point where I can’t decide what to cast on first. In the meantime, I’ll go back to spinning. It looks lovely! Even though I’ve got a wheel now, I still tuck my spindle in my bag when I’m heading out & there’s even a chance of a wait. It’s so easy to stop & start.